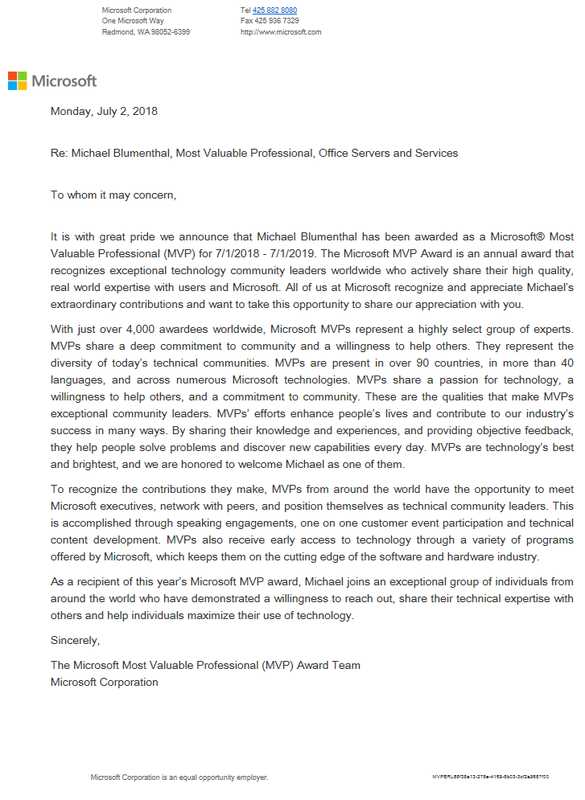 I’m a Microsoft MVP for the 4th year in a row! Being an MVP is a great honor. It recognizes for the technical community leadership activities I do including co-leading the Office 365 Adoption User Group (Chicagoland chapter) and public speaking on Office 365 topics. It also keeps me on the leading edge of Office 365 through monthly training that Microsoft provides. I also get to interact with some amazing people: my fellow MVPs and the Microsoft staff that make Office 365. This entry was posted in MVP, Public Speaking by Michael Blumenthal. Bookmark the permalink.